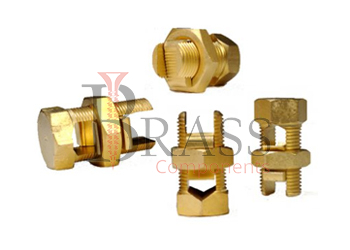 Split Bolt Connectors are manufactured from Brass, Copper, Aluminium, Steel, Stainless Steel or other material composition as per custom specification and requirements. Split Bolts provide convenient way of connecting and disconnecting multiple wire together inside bolt and securing them for electrical connections. Split Bolt Connectors are available with bright electro tin plating, chrome, nickle plated brass, zinc, copper alloy or any as per custom specification and requirements for corrosion resistant improvements and widely used for various applications. High Strength Alloy Split Bolt Connectors. UL, cUL and CSA Listed. No Special Tool require for installation. Highly resistant to corrosion and cracking. Reduce Contact Resistance, Corrosion Resistant and Vibration Resistant. Available electro tin plated bolt, nut, spacer and pressure bar. Split Bolt Connectors ensure connection performance and integrity. Provide quick turn threaded body which promotes easy installation. Provide high contact pressure between conductors to form solid bond connection. For grounding and bonding in earth or concrete. Widely used for wide range of stranded copper conductors. Ideal for Copper to Copper, Copper to Aluminium and Aluminium to aluminium connections. Provide secure connection on a full range of conductor combinations. We manufacture Split Bolt Connectors as per Custom Specification and export in France, Italy, Switzerland, Poland, Greece, UK and other European Countries. For more Information, Please Contact Us or Inquiry Now.